How else does dispersive refraction affect the colors we see? 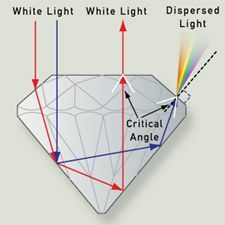 Crystals have their own colors (see emeralds and rubies), but dispersive refraction can enhance the appeal of a well-cut jewel. In a well-faceted gemstone, a ray of light passing into the top of the stone undergoes total internal reflection and is returned to the eye as the "brilliance." 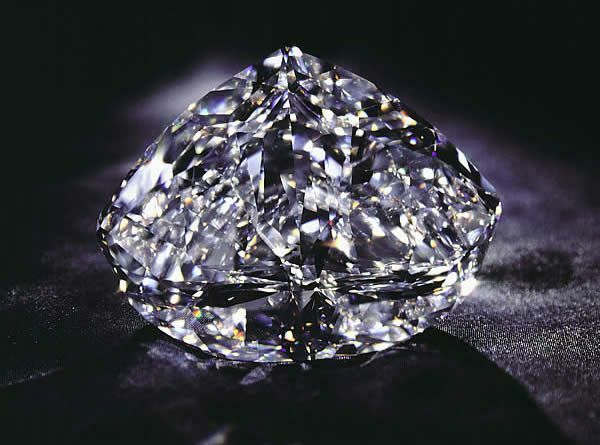 Light reflected back towards the observer will be dispersed by refraction if the gemstone has a high refractive index. Since the geometry of the path corresponds to that in a prism, the reflected rays are also refracted, leading to flashes of color, or the "fire" in a stone. The amount of fire depends on the magnitude of the dispersion. 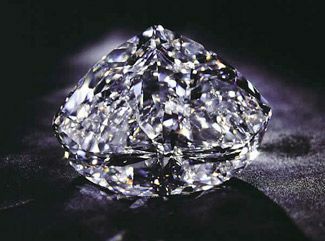 The diamond has a very high dispersion, the highest of any naturally occurring gemstone, as well as a very high refractive index. More complex effects occur in crystals that have a different refractive index for different optical planes. The crystal on the right is anisotropic and creates a double image, as compared to the isotropic left-hand crystal. "Double refraction" can be observed using crossed polarizers. 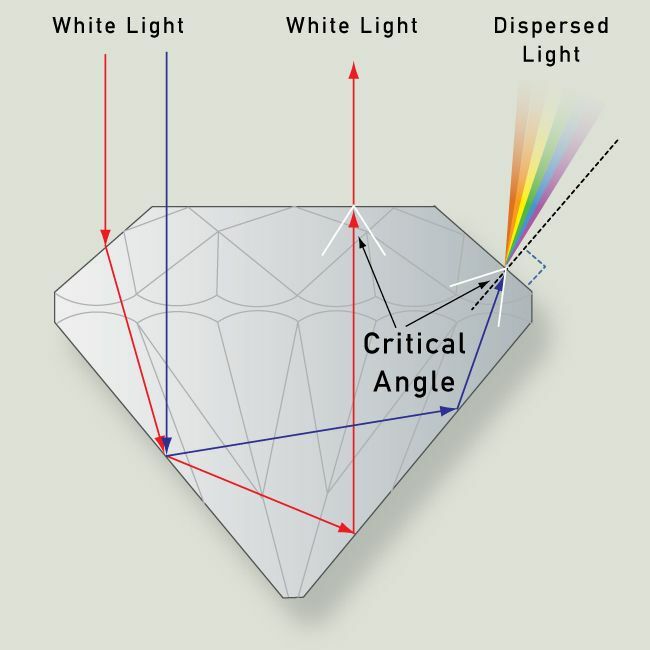 Because of the asymmetrical geometry of the crystal, polarized light is separated into ordinary and extraordinary rays moving at different velocities through the crystal. The second polarizer recombines these rays to produce color by interference. Light is dispersed into the colors of the spectrum by refraction. When we are using a refractive lens to enlarge an image, this becomes a problem; we don’t want to see the image with distorted colors at the edges of objects. This problem is known as chromatic aberration. 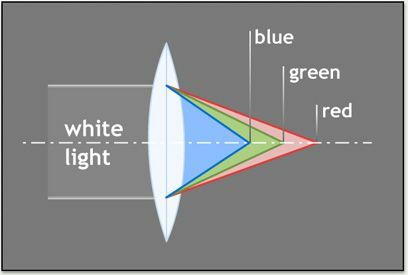 Chromatic aberration is a problem for any devices relying on lenses, such as telescopes, microscopes, and cameras. Digital cameras include software to compensate for this effect. 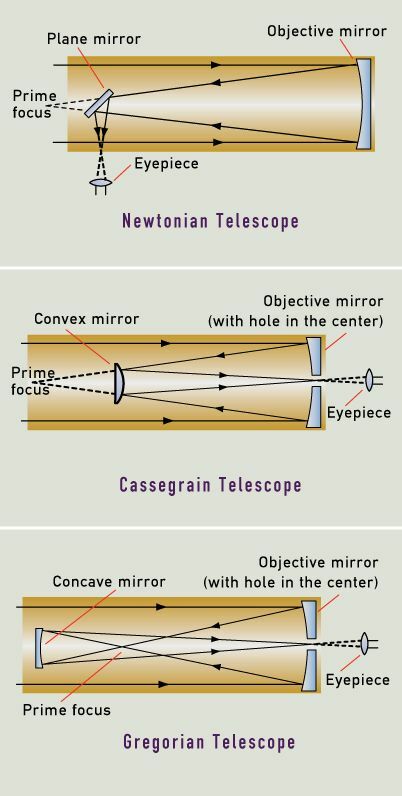 The magnifying lenses of early telescopes were simple convex lenses. At high magnification, refraction by these lenses dispersed the light into its component colors, haloing the stars and planets in rainbow colors and distorting the image seen. Newton was the first to solve this problem, enlarging the image by reflection instead of refraction. In addition to creating extra colors, dispersive refraction creates different focal lengths for different colors, so that edges in the projected image are blurred. This photograph shows uncorrected chromatic aberration. The window edges are blurred and colored. 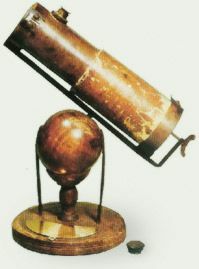 This is the design of telescope Newton developed to overcome the chromatic aberration inherent in earlier refracting telescope designs. Note that the eyepiece is on the side of the telescope, not at the lower end as in the telescopes we use today. 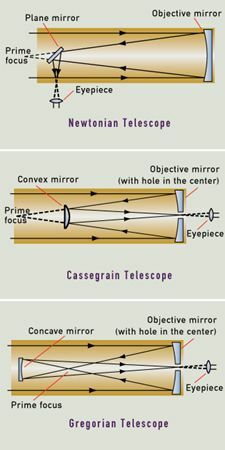 The essence of a reflecting telescope is that the refractive lens is eliminated and a parabolic mirror reflects the image. There are applications that still use a refracting lens, so other methods of reducing chromatic aberration are employed. One method uses lenses of glass with different refractive indices.  Joining a flint glass negative lens, which has a higher refractive index, to a crown glass positive lens, with a lower refractive index, forms a doublet lens corrected for dispersive refraction haloes.